A qingbai porcelain water dropper of bulbous melon form with a rounded body that gradually tapers in towards the rim. The body has a short curved spout and a small loop handle is attached to the opposite side. The body is impressed with vertical grooves and a wave pattern decorates the top of the rim around the mouth of the vessel. The cover is also decorated with a wave pattern and a small loop is attached to the top forming a finial. The exterior of the water dropper is covered in a pale greenish­-blue glaze that stops just short of the flat base, which is unglazed and shows the fine porcelain body. 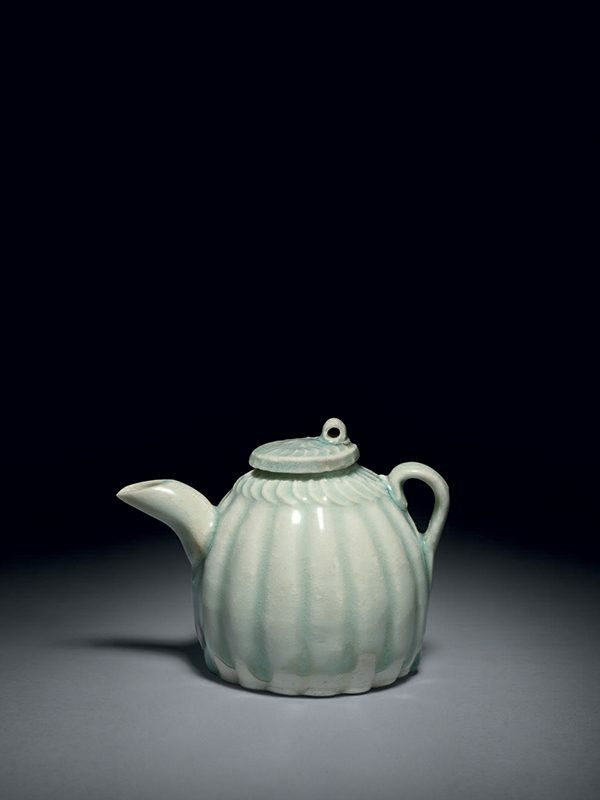 The influence of metalware on the potters of Jingdezhen is obvious in this fine piece. Melon­-shaped, multi-­faceted vessels such as this are derived from metal prototypes of the same period. A practically identical qingbai water dropper of similar size and also with a melon­-shaped body, dated to the Southern Song dynasty, is in the collection of the Jianxi Provincial History and Ancient Ceramics Committee. Another similar qingbai water dropper of comparable stylised melon­ shaped form, dated to the Southern Song dynasty, was unearthed from the Suining city, Sichuan province, and is now in the collection of the Suining City Museum.